Summary: The Asus G751JY is a beast, and while it's not the fastest 17 inch gaming laptop out there, it is probably the best value for the buck you can get right now. It can handle games smoothly at maximum details, it runs fairly cool and quiet, it looks good and feels strong, feels like something built to last. And that's why I believe it's worth buying, despite having a few minor issues, as you'll find from the detailed post. 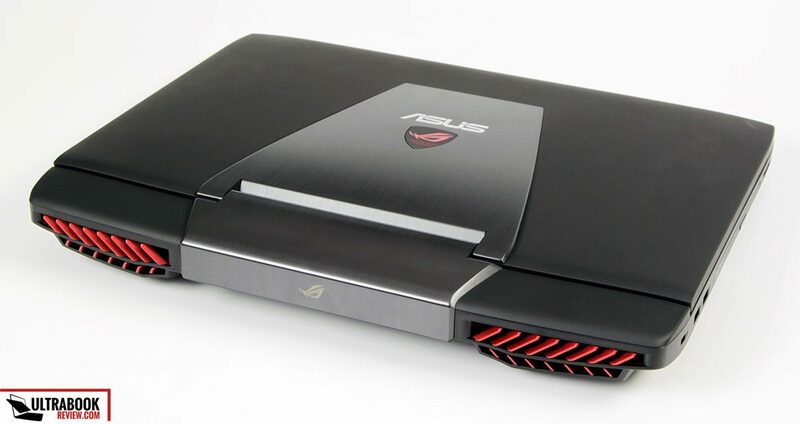 You might think there’s not much Asus could have improved on their massive 17 inch gaming laptops, but you’d be wrong, and the Asus G751, the device we’re going to review in this post, stands as proof. 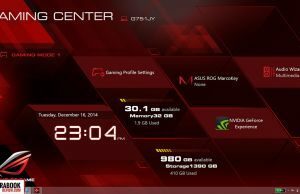 This one succeeds a model launched only a few months ago, in spring (the G750JZ), but significantly ups the game with a superior display (at last there’s an IPS panel on this ROG gaming machine), faster performance (Nvidia 980M graphics), a cooler and quieter use experience and a few design changes. 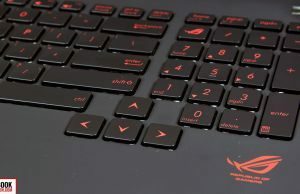 All these, bundled with all the other aspects that made the G7xx series great till now, make the Asus G751 one of the best gaming notebooks you could buy today, and you’ll find out exactly why if you’ll go through this review. On the other hand, the G751 is one of the largest and heaviest notebooks available out there, so it’s definitely not ultra-portable. 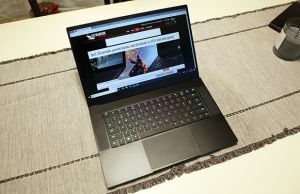 If you’re after a more compact, yet still powerful computer, you should check out my selection of gaming ultrabooks, as well as this list of all the ultra-portables built on Nvidia 970M and 980M graphics. Disclaimer: We’re testing a final release model of the G751JY, identical to the ones you can find in stores. 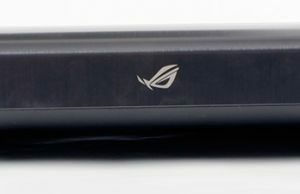 It came from Asus and I’ve used it for about a week before writing my impressions here. It went back to Asus afterwards. Let’s take a step back and have a better look at this laptop. The first thing you’ll notice when you’ll take it out of the box is how massive and heavy it is. It tops the scales at over 4 kilos and is about 5 cm thick. In fact, I’ve shown you how it looks next to a 13 inch ultrabook or an Ikea Magazine in the video, just for the sake of comparison. The massive power brick adds up as well, so if you plan to get this thing to LAN parties, expect to lug around 5 kilos each time. And buy yourself a roomy and proper made laptop bag. 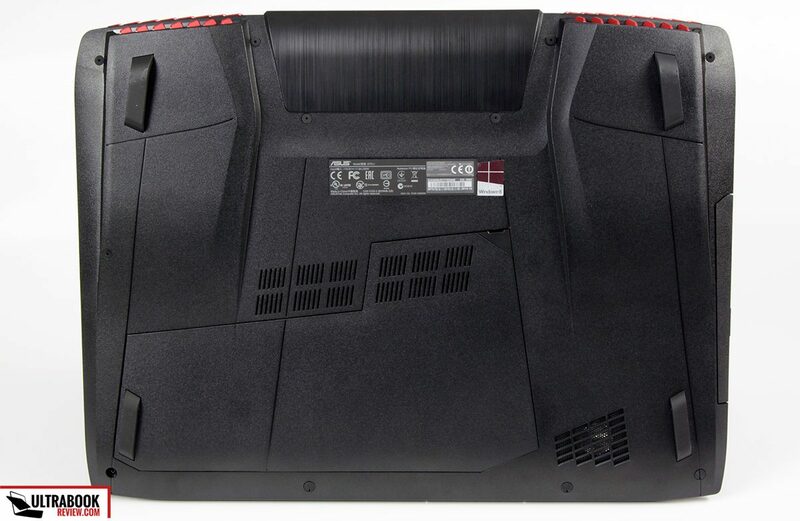 Many other manufacturers are pushing ultraportables these days, still the G751 remains devoted to its bulky body. But the truth is, if you do want the fast performance, you’re going to need a proper cooling system, thus enough space for it. And the G751JY does deliver on both ends: it’s fast and runs cool. Aesthetically, the G751 has been slightly redesigned from the previous G750. An aluminum plate partially covers the hood now and stretches towards the back, the exhaust grills are more massive than before and a suite of red ascents have been added around the body. For instance, there’s a red Republic of Gamers logo on the palm-rest, a backlit red shield on the hood (not overly bright though), red keys, red status LEDs and of course, the red painted exhausts on the back. 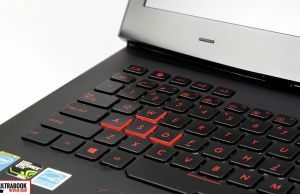 Some of you might not appreciate this new approach, but in my eyes the laptop looks spectacular and has the aggressive lines to match the performance, with only a few flashy elements and no glossy plastics or colored LEDs like we’ve seen on other gaming machines (and yes, I’m looking at you, MSI). Still, while the previous Gs could have been accepted in strict business environments, this new G will probably not. If we look past the bulk and and the heavy body, the G751 is quite practical. For instance, soft materials are used for the interior, which feel very nice to touch, but will show smudges easily. 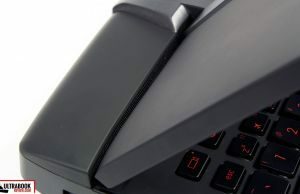 Plastic is used for most of the case, but with a rubbery texture, so I doubt anyone will complain. The palm-rest is generous and the keyboard slightly lowered into the frame, for a more comfortable typing position. 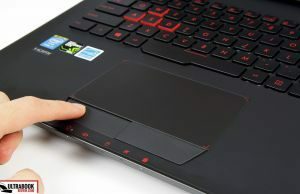 On top of these, Asus put the display closer to the user, thus bringing us closer to the action and allowing extra room in the back for the radiators. Smart. 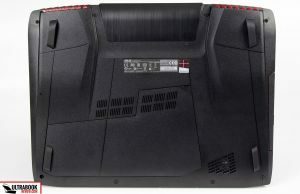 And if you’ll turn the laptop upside down, you’ll notice the four sturdy and massive rubber feet designed to keep the beast in place on your desk, but also the interesting belly design, meant to allow a proper air flow. 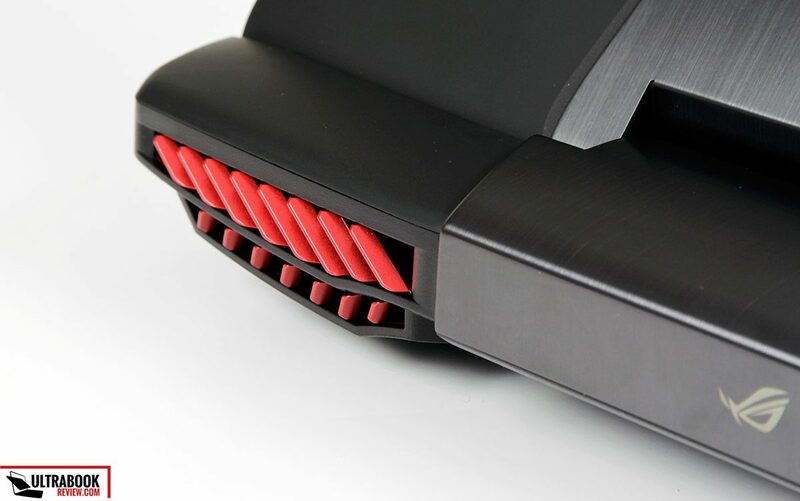 There are only two small air intakes towards the middle, but even so, the laptop’s cooling system is spectacular. I’ll tell you all about it below. The IO is solid on this machine. 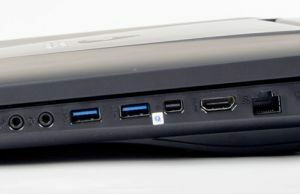 There are 4 USB 3.0 ports lined around the sides (no USB 2.0 though, which could cause some incompatibilities with older USB peripherals), a LAN port for fast wired Internet, all sorts of video output options (VGA, HDMI), a Kensington Lock and last but not least, there’s a miniDP / Thunderbolt port. 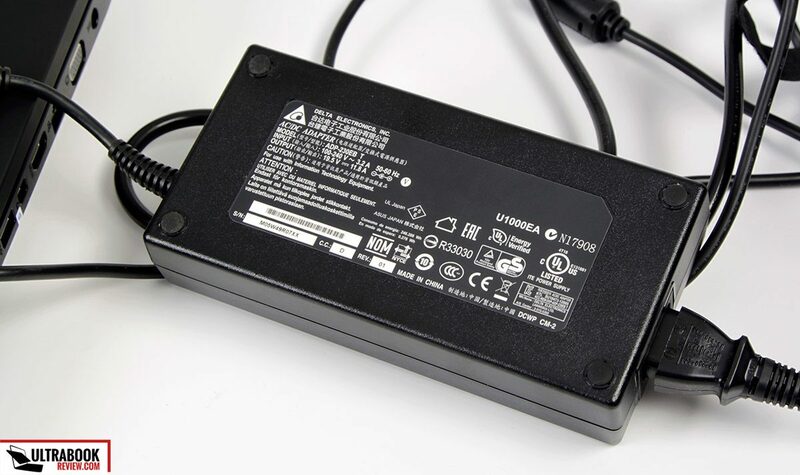 In fact, the G751 is one of the few Windows laptops with a Thunderbolt port, which makes it compatible with various professional accessories or high resolution external monitors. 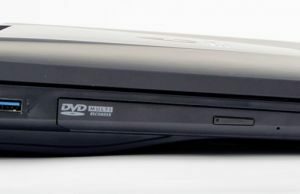 There’s also an optical drive, with an option for a DVD Writer, like on this test unit, a Blu-Ray Combo or even a Blu-Ray Writer. 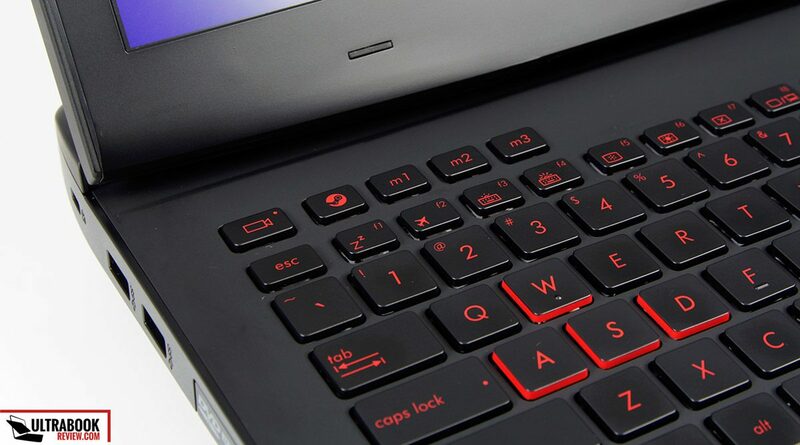 The keyboard on the G751 is a refinement of what we’ve seen on other G series laptops in the past. 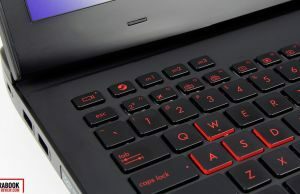 The layout is spacious, the entire keyboard is illuminated (red backlight, with 3 intensity levels) and the keys’ travel, feedback and finishing is adequate for a high end notebook. There’s a NumPad area on the right and the arrow keys are nicely separated from all the others. 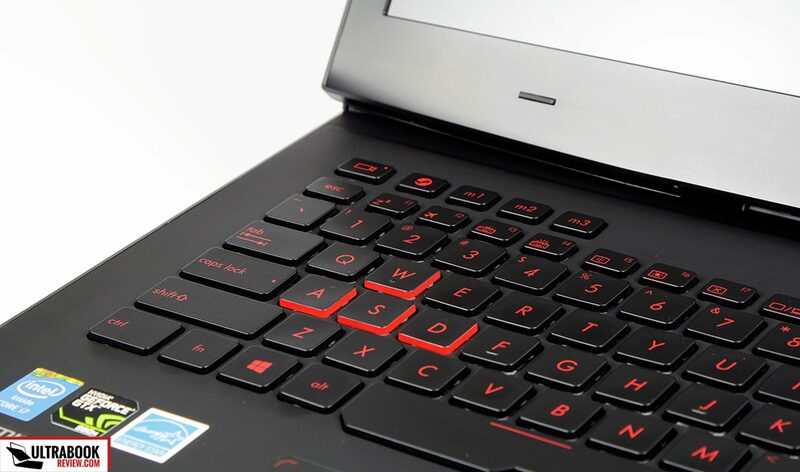 The WASD keys pop out, thanks to their visible red border and the slight lump on the W key, which lets you find it easier without looking. And on top of that, the Space key is wider towards its left side, thus more comfortable to hit with your thumb. 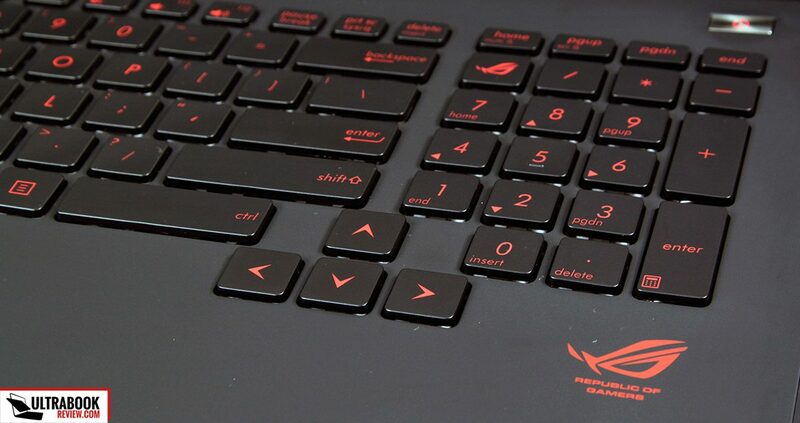 But not everything is golden with this keyboard though and there are at least two aspects I believe Asus should have designed better. 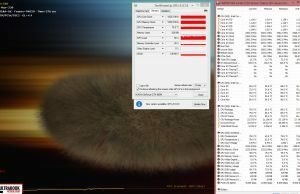 Number one, the NumLock key has been replaced with an Asus GameCenter key, which launches a metro-style app that allows you to check out the amount of available storage or RAM and easily launch the Splendid or AudioWizard utilities, among other things. It also allows to create custom profiles for various use scenarios, if you want to. But the thing is, you’ll hardly ever use these and the GameCenter surely did not require a dedicated key, especially when it replaces another that people actually use. My other nit is with the set of 5 macro keys in the top right corner. 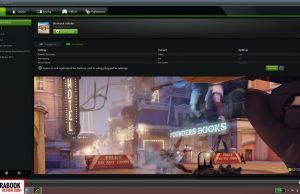 There’s one that launches ShadowPlay, one that launches Steam and three customizable macro keys that you can set up to do various things in games or in Windows. The latter could prove useful, but I ended up hitting that ShadowPlay key often when reaching for Escape, which I’d reckon is a major problem for someone who’s recording or streaming their gameplay. Annoying, to say the least. 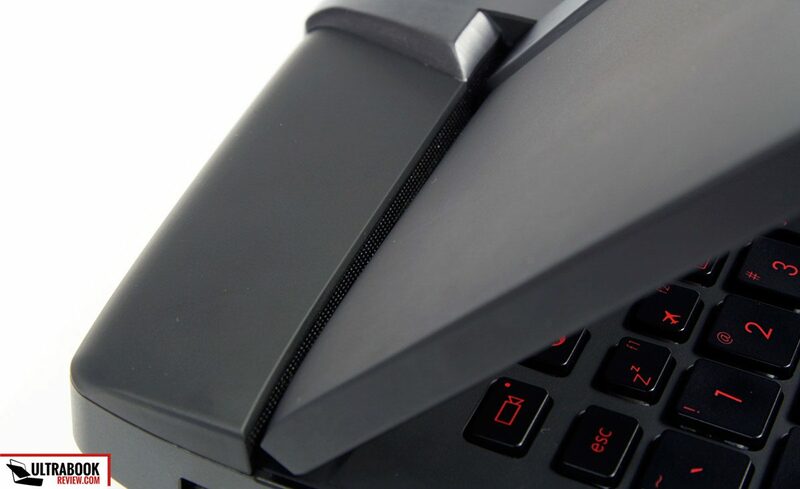 Anyway, let’s turn our attention to the trackpad, which is one of the best I’ve ever seen. Its surface is gigantic, smooth and accurate. It’s not clickable, as you get actual mechanical click buttons beneath. But it did reply promptly to my single or two finger taps or my gestures. 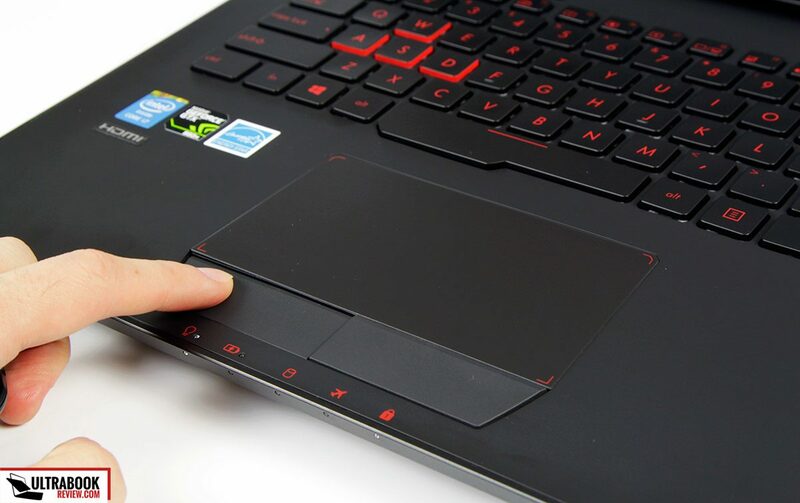 So long story short, this is the kind of trackpad I wish more manufacturers would put on their laptops. Too bad it probably won’t be used that much on this computer, as I’d reckon most buyers would have a gaming mouse connected most of the time anyway. 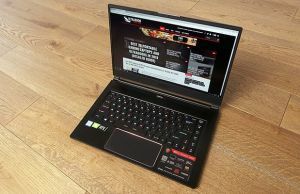 The G751 also qualifies as a solid multimedia laptop. Well, it mostly does, and you’ll see why in a bit. The excellent news is that Asus finally decided to put an IPS panel on their big ROG notebook, while all the previous generations were stuck with TN panels. And that leads to improved viewing angles, popping colors and deep contrast. average DeltaE: 1.97 uncalibrated, 1.25 calibrated . My only complain is with the slight Blueish tint. It can be fixed with a screen calibrator, otherwise Blues are going to be oversaturated. 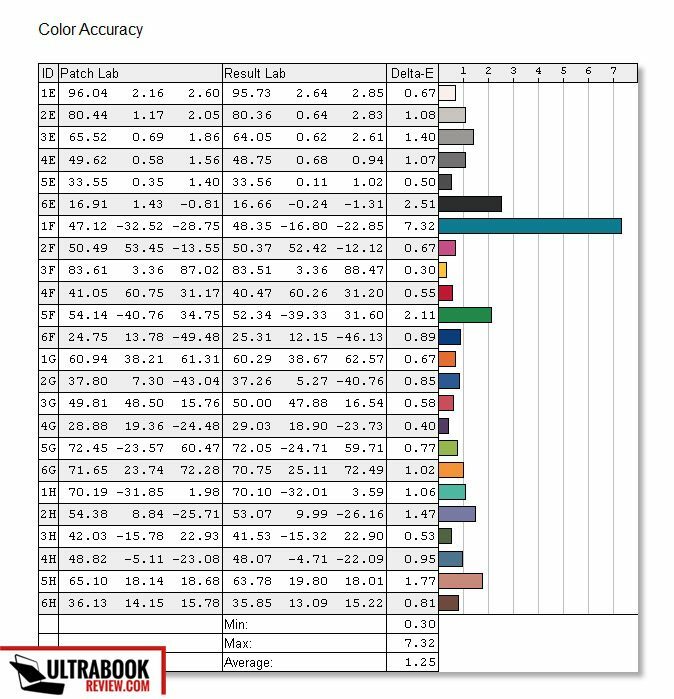 Not a major complain, but something those that need color accuracy must take into account. The display is matte and does not support touch, just like it should be imo on a proper gaming machine. But some of you might find the 1920 x 1080 px resolution too low by today’s standards and truth be told, most competitors do offer higher resolution screens these days. But there are benefits to choosing a 1080p panel only: games will run smoother at native resolution and there are no scaling issues to deal with (which is still a pest, especially when it comes to older 3rd party apps). But let’s jump to the beastly performance this thing delivers. 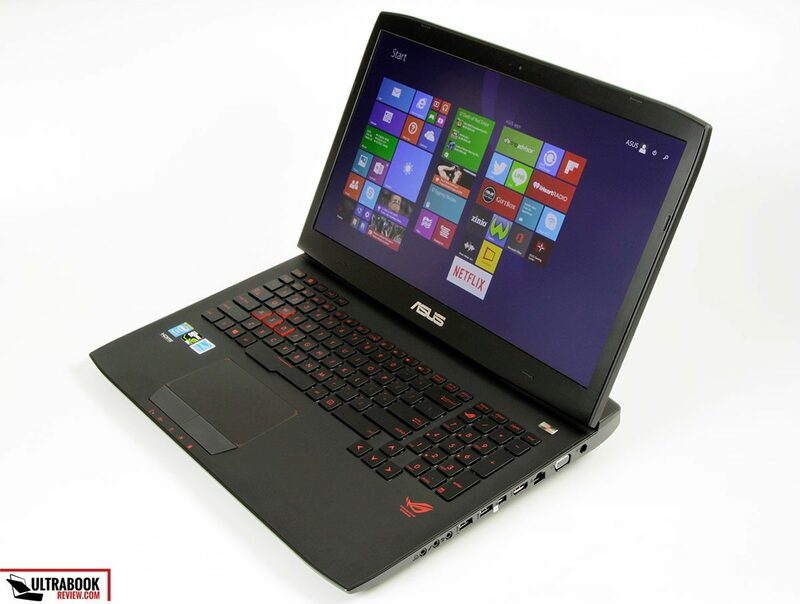 Our version, a G751JY, comes with an Intel Core i7-4860HQ processor, 32 GB of RAM, an Nvidia 980M graphics chip with 4 GB of VRAM and a dual-storage solution, with a very fast PCIE SSD (a 256 GB Samsung MZHPU256HCGL) and a regular 2.5” HDD (a 1 TB Hitachi HTS721010A9E630 7200 rpm 32 MB buffer drive). 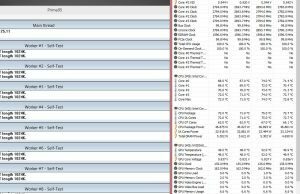 The PCIE storage solution is lightning fast and even the included HDD is not a slacker either. 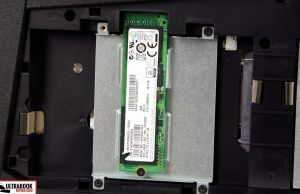 By default both the SSD and the HDD are divided in two partitions each, but you can change that if you want to. 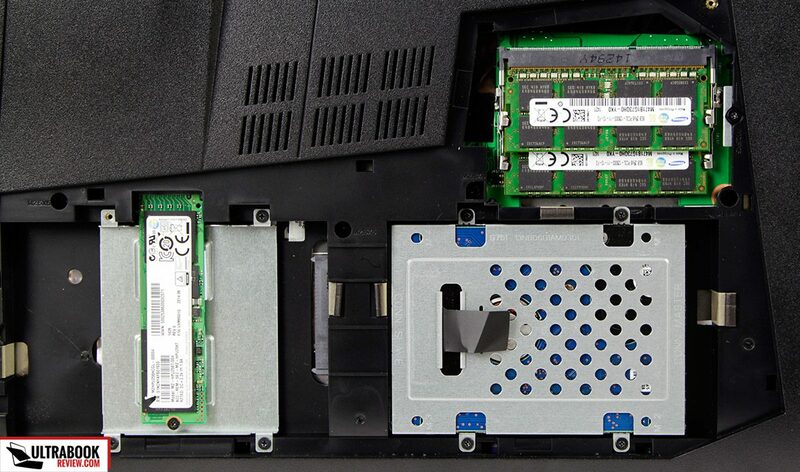 It’s worth noting that this laptop actually has two 2.5″ bays inside and one of them gets a special cradle for the PCIE M.2 stick, while the other gets the bay for a standard 2.5″ HDD. 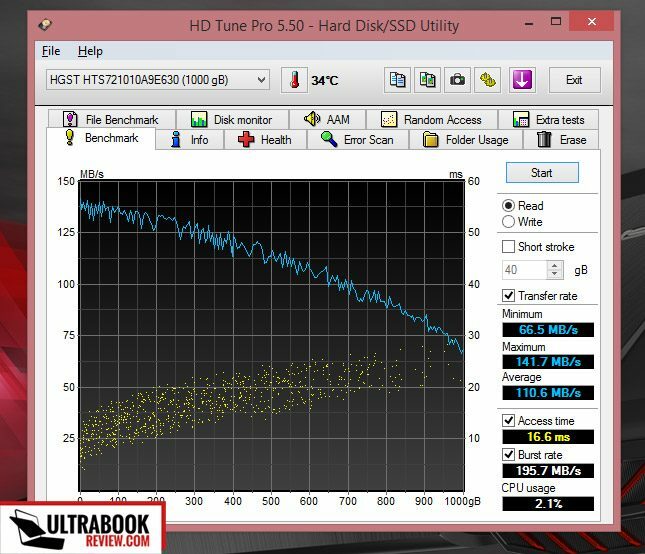 So there’s no dedicated spot for the M.2 SSD, like on the Asus G771. 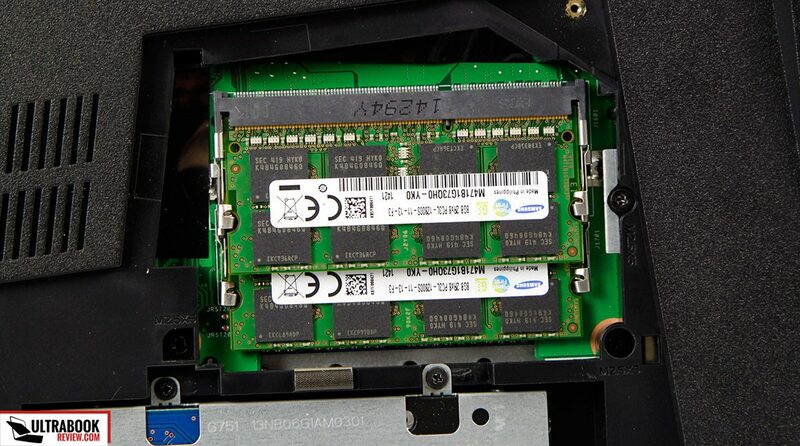 What I don’t know for sure yet is whether the PCIE cradle is included with all the G751 configurations, as some of the lower models only ship with a 1 TB HDD. I’ll have to check this out. Anyway, accessing the internals is actually very easy. 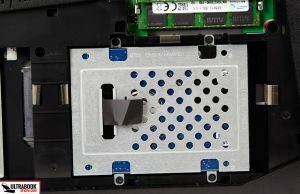 There’s bay on the back, hold in place by a single self-retaining Philips screw and if you’ll pop it out, you’ll get access to the two storage drives and two of the 4 memory bays. The other two are behind the motherboad from what I can tell, thus more difficult to get, but that shouldn’t be a problem, since even the basic configurations come with 16 GB of RAM (those two less accessible slots are filled up and the accessible ones are free). That Nvidia chip is the big novelty here and allows the laptop to crunch flawlessly through all the recent games at the native 1920 x 1080 px screen resolution with Maximum details. I’ve tried all sorts of titles and haven’t noticed any hiccup at all. In fact, Nvidia’s 980M chip is a major step forward from the 880M chip found on the previous Asus ROG 17 incher, both in terms of speed (20- to 30 % better results in most games), but also in terms of efficiency (more about that in the battery section). It’s worth mentioning that Asus only went with the slightly snipped version of the 980M chip here, the one with 4 GB of VRAM, while there’s also another option, with 8 GB of memory. However, you’ll barely see any difference between the two variants in any of the current titles. 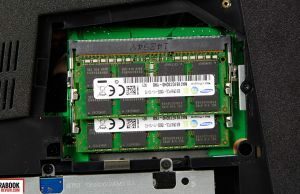 Future games might require more memory if you want to play them at maximum details. For instance, there are already games like Shadow of Mordor that require graphics with at least 4GB of memory to handle their high-resolution textures. So long story short, you shouldn’t worry about this aspect too much right now, but if you want to keep your gaming laptop for many years and you’re willing to pay extra for a laptop that bundles the 8GB version of the 980M chip (like the MSI GT72), then you can consider doing so. 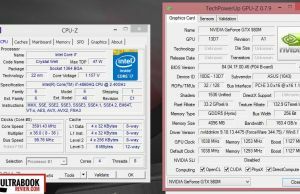 I also ran a few benchmarks on the G751 and some stress tests. And of course, it’s not even worthy mentioning that this thing can easily handle everyday activities, but also demanding software like Adobe Premiere, Photoshop, Eclipse, etc. 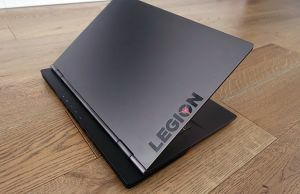 In fact, it can easily handle everything you might throw at it and that makes it a great desktop replacement or development laptop. 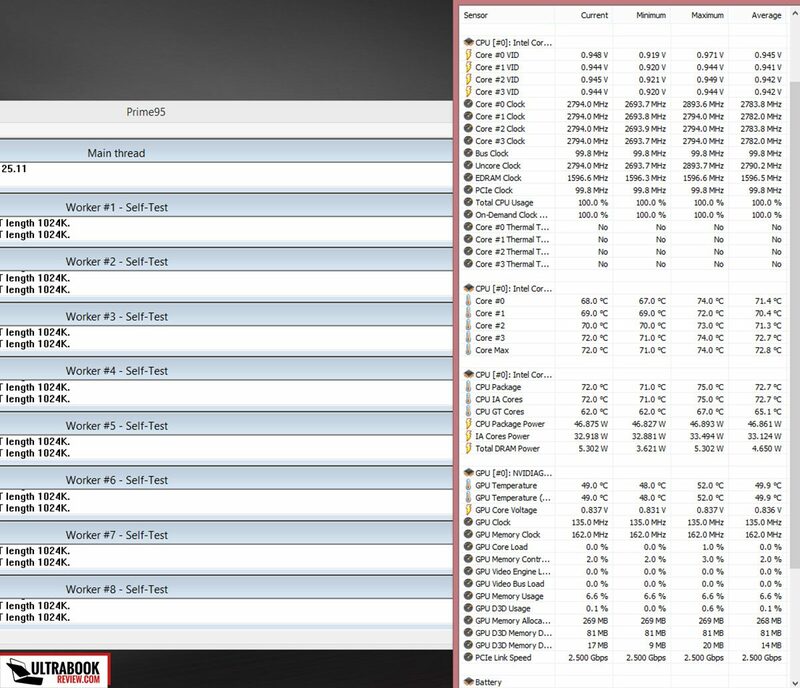 CineBench R15: OpenGL 140.66 fps, CPU 633 cb. 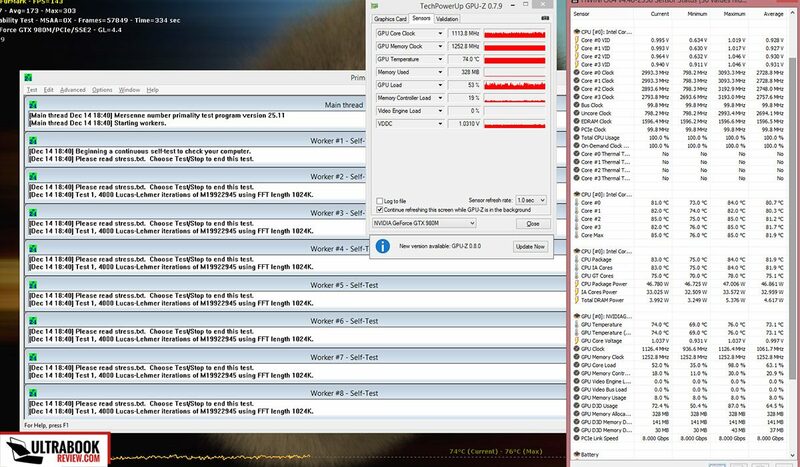 The hardware never throttles, not even when stress tested with Prime 95 and Furmark, as you can see below. 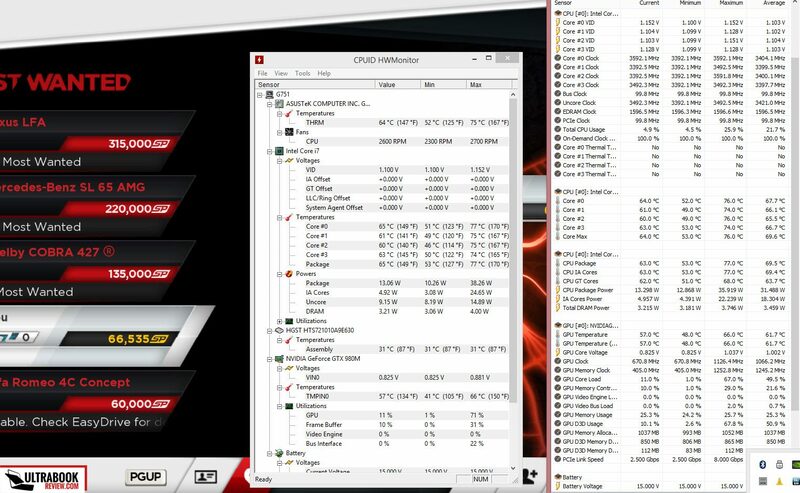 No throttling at all, not even when running both at the same time for 30+ minutes. So performance wise, this thing is a beast. And the great news is that it does all these while running fairly quiet and cool. There are a few reasons for that, but the main one hides behind the two red-painted cooling exhausts on the laptop’s back: the cooling system. 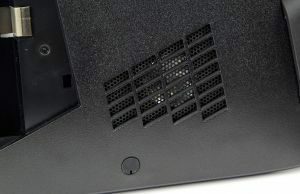 There are two cooling grills with independent heat-pipes and one handles the graphics, the other the CPU. Air is sucked from the belly and the keyboard and blown towards the back, so you’d better not have anything heat sensitive behind this machine. 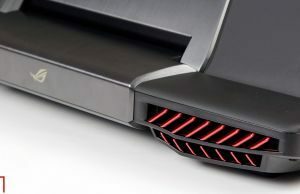 With daily use, the laptop remains very cool, but the fans do kick ON all the time, even when the computer sits idle, so you’ll hear them in a completely quiet room. Under serious load, the area around the heatpipes and the cooling grills go above 40 degrees Celsius, but the palm-rest and the keyboard remain close to the room temperature, which leads to a very comfortable thermal experience in games. The fans become somewhat louder though, averaging about 48 dB at 50 cm away from the laptop according to my iPhone app, which is definitely not silent, but at the same time not bad either on a gaming machine like this one. 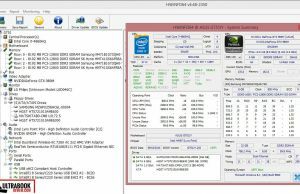 The hardware inside reaches decent level temperatures under load, and you can check out all the results in the pictures posted in the previous section. That aside, connectivity wise the G751 offers Wireless AC, Bluetooth 4.0 and Gigabit LAN, so pretty much what you’d expect from such a computer. Asus went with an Intel AC 7260 dual-band Wi-Fi adapter which proved fast and reliable throughout my tests, so nothing to complain about here. I wasn’t impressed by the audio system though. On paper, things sound great, with stereo speakers hidden behind the screen, facing the user, and a subwoofer on the belly. In practice though, these speakers sound blend, with very little base and plenty of distortions even at mid-levels. The audio system is loud, there’s no doubt about that, but the sound coming out of them is not what I was expecting from an ROG laptop and not on par with the older G750, at least imo. Thus if you’re an audiophile, the G751 will hardly satisfy you. Luckily though, the audio jacks on the right side are far better, thus connecting a pair of proper headphones or external speakers into that SPID output will greatly improve your multimedia experience on this machine. And I’d reckon most of you were going to do that anyway, after all, this is a gaming machine. Last but not least there’s the camera on top of the screen. Fairly good, although it lacks a higher resolution sensor(720p only) so it won’t be good enough for streams. But it will do alright for occasional Skype calls. I could also tell you a few words about the battery life though, but first you should know that the battery is no longer easily removable on the G751, like on the G750. So if you’re one of those persons that like to disconnect the battery when using the computer plugged in for a longer period of time, well, that’s not going to be possible on the G751. 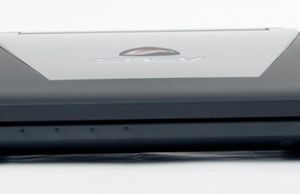 It’s still big, an 8 Cell battery with a capacity of 88 Wh, but this computer does not have Optimus, or in other words, the integrated graphics chip within the CPU is disabled and the computer relies solely on the Nvidia chip, active all the time. And that means you can only expect about 2 to 3 hours of daily use on a charge and even less when playing games. 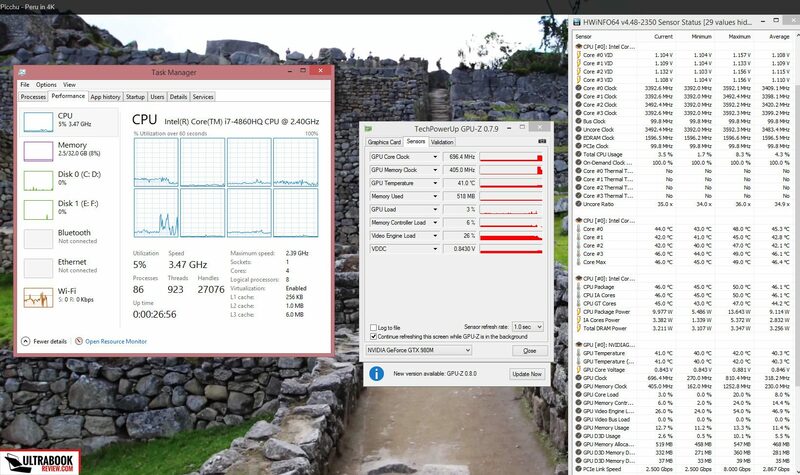 18 W (~5 h of use) – idle, Power Saving Mode, screen at 0%, Wi-Fi OFF. 30 W (~3 h min of use) – 1080p .mkv video on VLC Player, Balanced Mode, screen at 40%, Wi-Fi ON, keyboard’s back-lightning OFF. When it comes to games though, the laptop is usually going to deplete the battery in around 1 hour, but will last a bit more when running older titles. 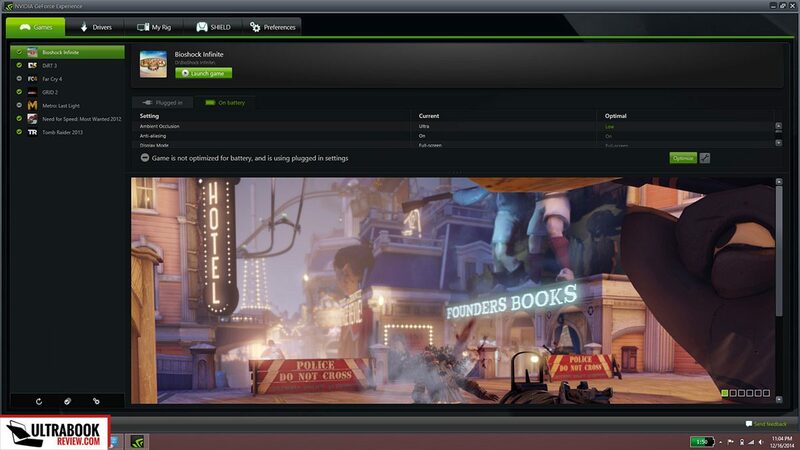 There is this option called Battery Boost in Nvidia’s Geforce Experience utility which tweaks games in order to squeeze the best performance when plugged in, and good performance with decent battery life when running on battery. The app tweaks each game’s settings and limits the numbers of frames per second to a given amount you can set up yourself, between 30 to 60. And it actually works quite well with this newer 980M chip (the option isn’t something new, but the boost is greater with the 9xx series chips), significantly boosting autonomy, especially when running some older games. For instance, while running Dirt 3 at max settings without Battery Boost activated, the laptop will last about 55 minutes on a charge. However, with Battery Boost ON, the utility’s recommended settings loaded and an imposed upper cap of 45 FPS, the battery runs out in 1 hour and 15 minutes, while the gaming experience remains flawless. The difference is not as visible with recent and more demanding titles, but it’s there. Of course, I should mention that the laptop won’t offer the same performance on battery as it does when plugged in, simply because the hardware needs a lot of energy, and the battery is limited to provide only 100W of power, from what I understand. Plugged in, the system will sip closer to 200 W at full-load, that’s why Asus includes a massive 230W power brick with this laptop. 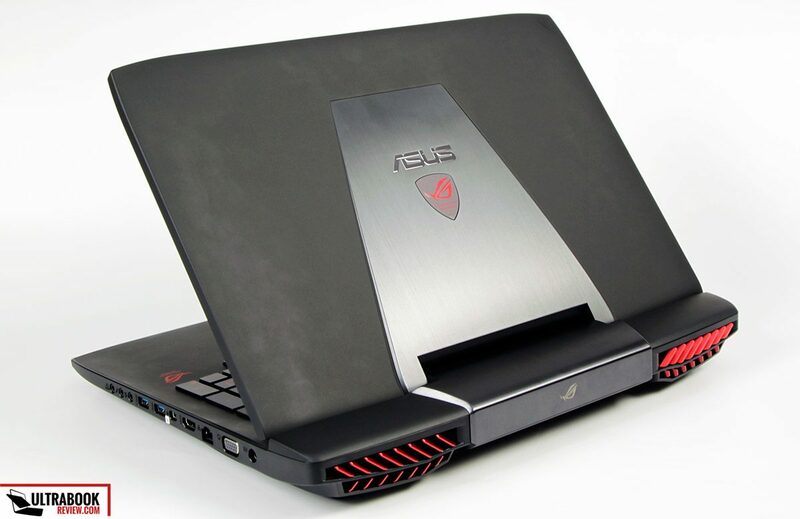 The Asus G751 is available in four different configurations and you can buy them worldwide right now. I’m going to list the models available in the US, but they should be mostly the same (with slightly different names though) where you’re living. 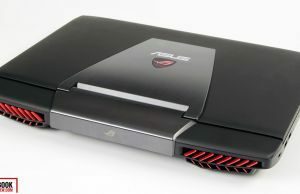 ASUS ROG G751JT-DH72 – $1499 – Intel Core i7-4710HQ CPU, 16 GB of RAM, Nvidia 970M 3 GB graphics, 1 TB HDD, DVD Writer. Follow these links for updated prices and configurations on both the G751JY and the G751JT models. 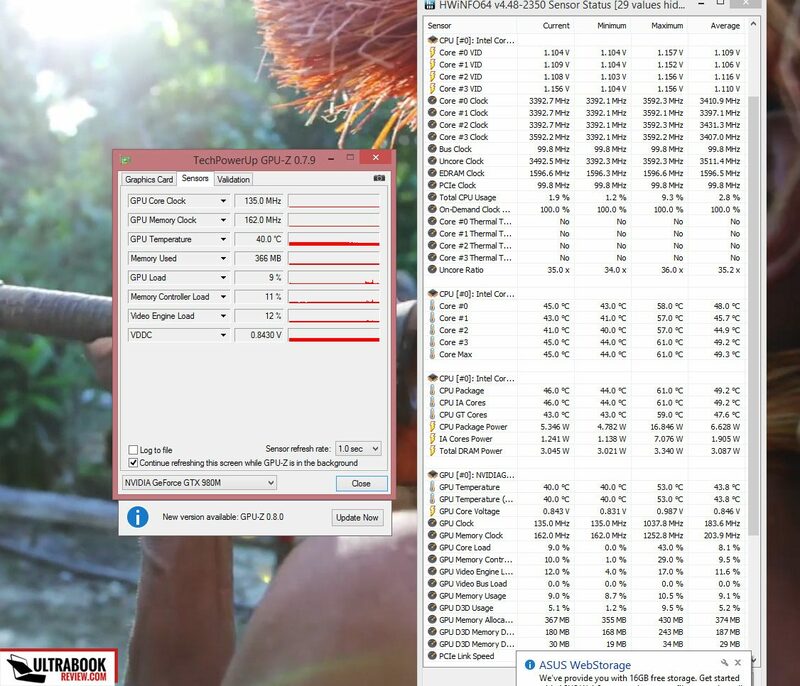 The G751JT only pack the 970M Nvidia chip, which is significantly slower than the 980M graphics on the G751JY models. Still, if you’re on a low budget, the JT is still an excellent choice, especially since it’s several hundred dollars cheaper than the JY. Personally I’d look at the G751JY-DH72, which sells for under $2300 these days, despite its higher list price. The slightly faster processor, extra RAM and larger SSD on the DH72X aren’t something I’d gladly pay extra for. 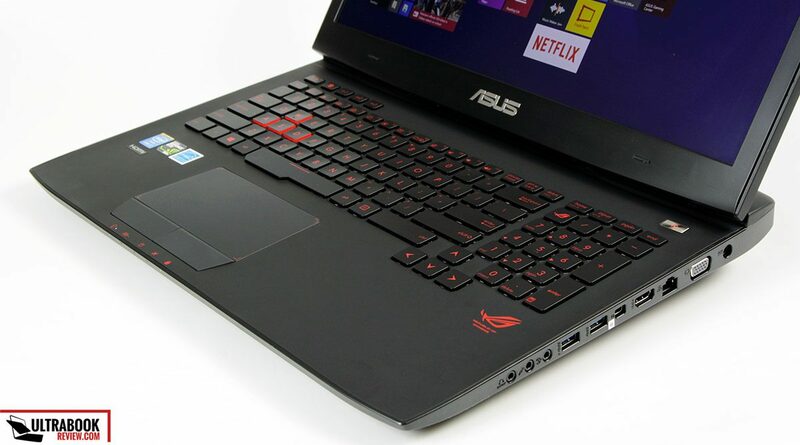 At the end of the day, the Asus G751JY is a beastly gaming laptop, but at the same time a bulky and heavy machine, thus not something you can effortlessly move around. It is still a laptop, thus portable, but only if you’re willing to lug around its 5 kilos each time. 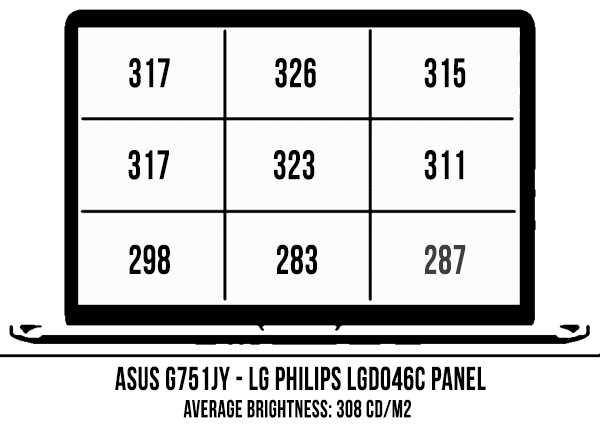 If you’re fine with this particular aspect, there’s not much you can say wrong about this Asus G751 series. It looks spectacular and it’s properly built, it handles smoothly all the latest games, it runs mostly cool and quiet and offers the keyboard, display and the IO you’d expect from such a machine. And it does that while being several hundred dollars than its main competitors, namely the MSI GT72, with its fast Nvidia 980M 8GB graphics. Of course, the G751JY is still far from perfect, but it does what really matters right and that’s why I for one can look past its minor quirks. And the bulk. 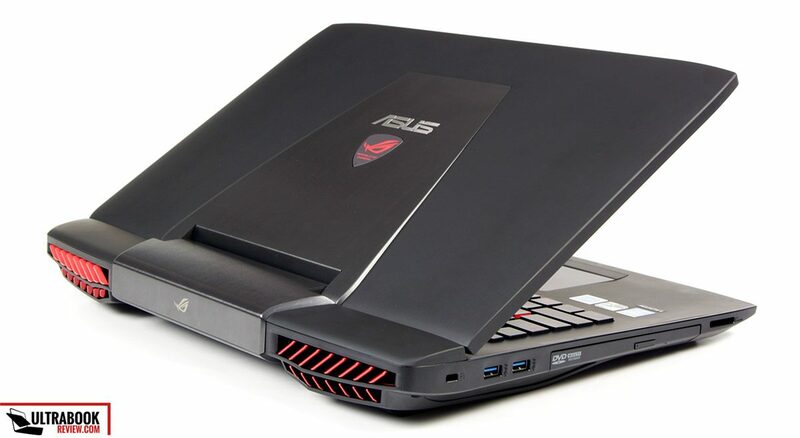 If you feel the G751JY is not what you’re looking for, then perhaps you should have a look at my selection of gaming ultrabooks, or my list of ultrapotables built on Nvidia 980M and 970M graphic platforms. Anyway, that sums it up for now. If you have any questions or anything to ad to this review, the comments sections below is open and I’m around to reply. Thank you for sticking by till the end and I’ll catch you later. Excellent review. Just a typo I believe: “The G751JT only pack the 970M Nvidia chip, which is significantly faster than the 980M graphics on the G751JY models.” I think you mean slower? Does the laptop use OPTIMUS , technology? mind doing a review for the new Alienware 15? specifically the one with the gtx 970m chip. I think that one has the best value for money. I’m having a very hard time getting my hands on Alienware laptops over here, but I’ll try. Slim chances though. Got G751JY the other day. Confirmed poor sound quality and mediocre display… The rest is just great though. 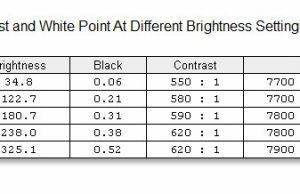 Because I come from a AUO B156HW01 v.4, 96% Adobe RGB Gamut, 6500K etc. The display is truly mediocre in this expensive laptop, also calibrated it misses too much colors, red == heavy orange, yellowish pictures. Shame on ASUS. 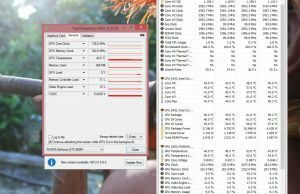 No fan problem, Do something that uses GPU and it will blow hot air. 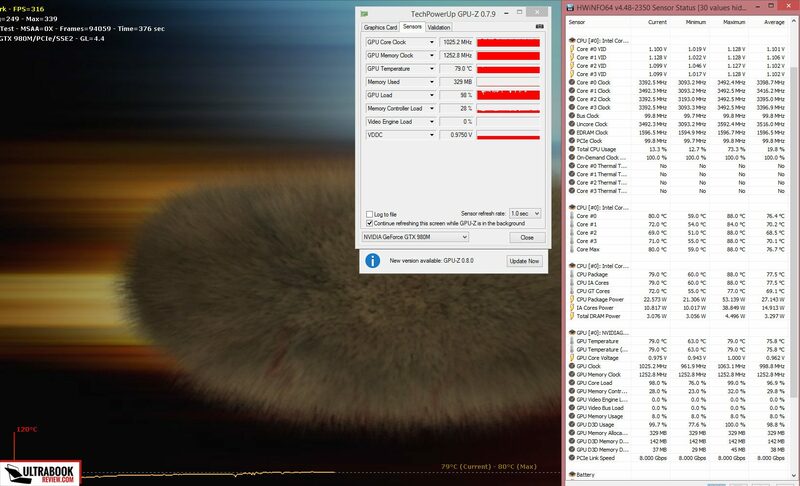 the main thing is that GPUs rarely get warm doing windows things. You will see this in desktop cards too, Almost nothing doing things like surfing the net. the unigine valley benchmark for example warms things up. I am still loading in my steam library to see if games do though. I know the fan is blowing either way with the ole finger lick test to check for a breeze. This laptop seems to have really good thermal to noise. That was a very objective review….great work, kudos !! 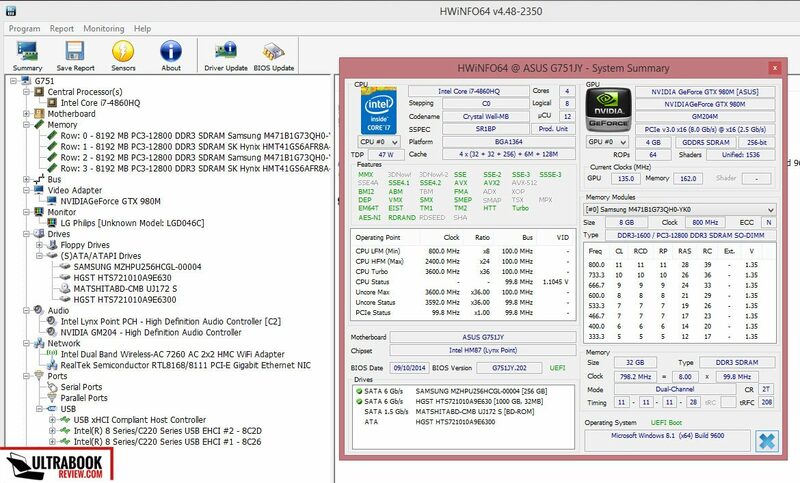 can you please advise me on the issue : I need a high performance system for 3D modelling with core i7 processor, at least 16 GB RAm and 4 GB nvidia GPU. 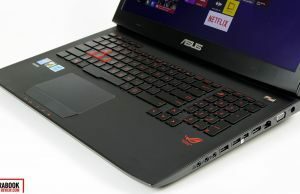 Can i go for Dell Precision M6800 or Asus G751??!! Money is not a constraint as the project is well funded. I will be grateful for the help. I’m not familiar with that Dell, so can’t comment on it, but I can vouch for this Asus. Clearly they are two different machines but between this asus and the MacBook Pro 15 which one has the best performance, the best speed? 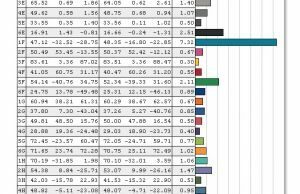 I am not interested in games just programming, coding, math and stats models in matlab VBA etc …, large datasets. 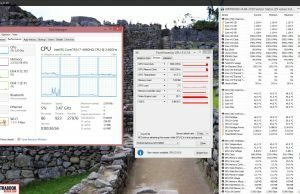 This one can be equipped with a slightly faster processor, more RAM and more diverse storage options. Performance wise, I’d pick it over the Mac, unless design or portability are important. One thing to consider are temperatures under load. Since the Mac is much thinner, it will heat up easier. 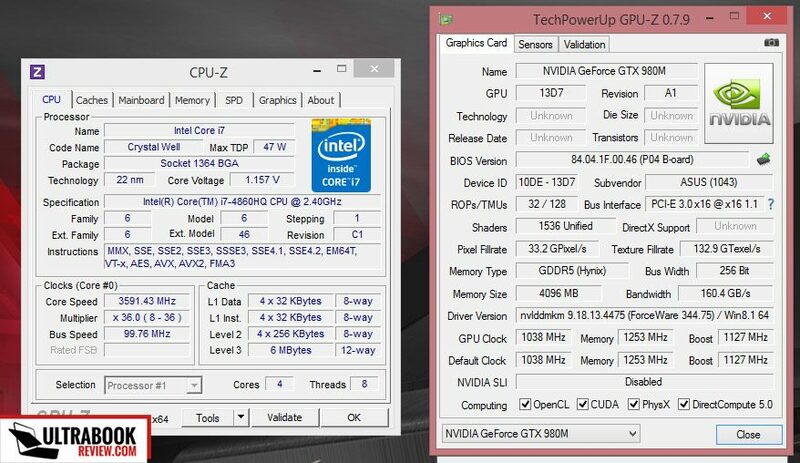 On the G751JY temperatures are not going to be a concern, nor will be throttling. 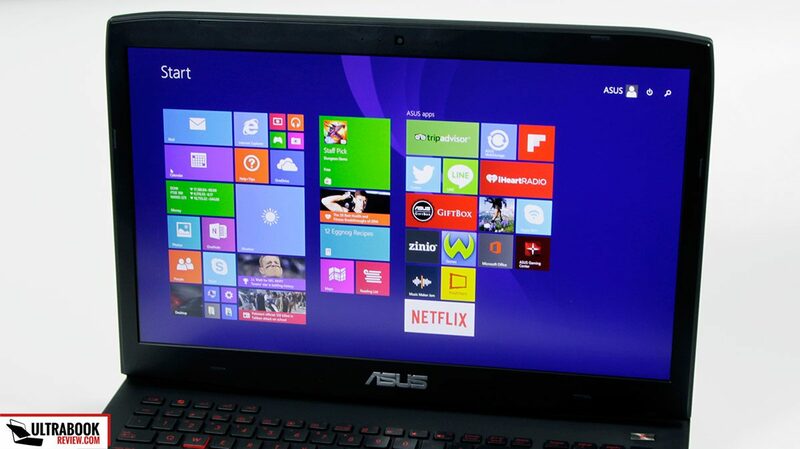 I will wait for windows 10, then I will buy the asus or the similar one that at the time will be available. 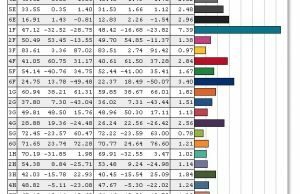 I want a 17.3 because at home I can read everything much better (and I do not want to buy an external monitor), then I will buy prob. 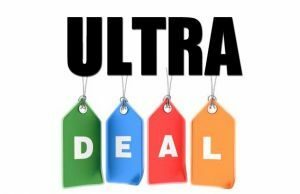 buy a dell xps 13 for travelling (it should be able to handle some programming, coding, math and stats models in matlab VBA etc …, as well). 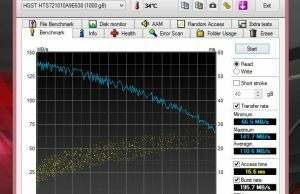 May be a last question: for the Dell the best option for battery and productivity is clearly the full HD, but in case I buy the QHD+ (3200 x 1800) do you think I will have the scaling problems with high resolution using excel, VBA, matlab, Eviews? For example at the moment with Windows 8.1, does the excel menu look very small with a QHD+ (3200 x 1800)? I think that for my needs they will deliver similar performance but I thought to ask you. 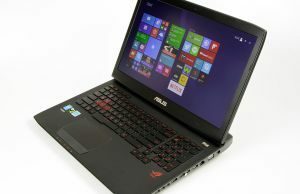 between Asus G751JY and Acer Predator 15, which one you recommend? The Asus gets a larger screen, but it’s also a larger and heavier device and you can find it cheaper than the Acer. If you don’t mind the extra bulk and don’t need the extras provided by the Predator (DDR4 memory, NVMe storage, etc), I’d get the G751. But which one performs better for gaming? lets say I do not care about the size, price and the weight. 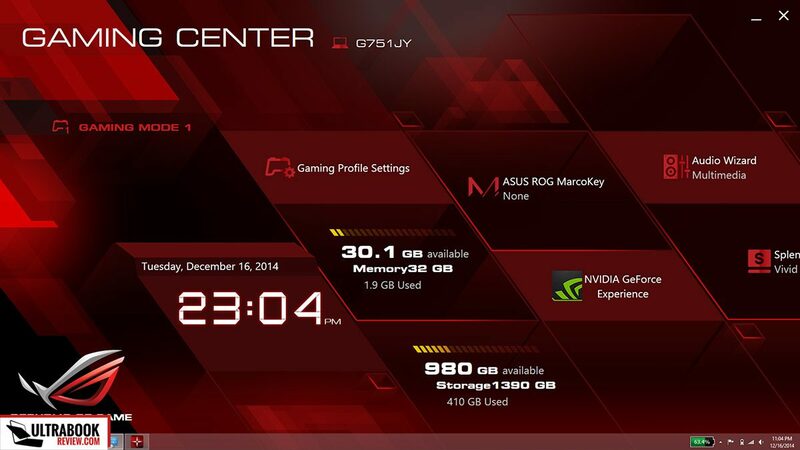 The Predator gets a newer processor, and that will have an impact in games. Nor a significant one though. That of course if we’re considering the 980M 4GB versions for the graphics on both of them.